Opreys are raptors that live near water statewide. 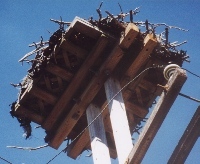 The nests are used year after year and grow quite large. This one has strips of black garbage bags woven in it.